Lari Don was born in Chile and spent most of her childhood traveling around South America. She is an award-winning author of children’s books and short stories. Lari lives in Edinburgh, Scotland, with her cats. Click here for more stories by Lari Don. 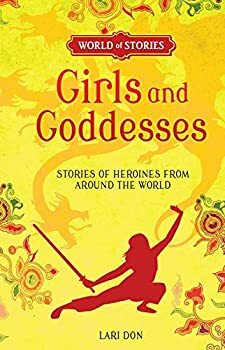 Girls and Goddesses: Stories of Heroines from Around the World, written by Lari Don and illustrated by Francesca Greenwood, is a collection of thirteen folktales in a wide range of time and place. While the language is a little flat, for the most part I found it an enjoyable read. And it’s yet another alternative to all those princess-rescued-by-the-boy-hero that used to be the norm.